We open the Weekend America mailbag and hear listener reactions to our stories. 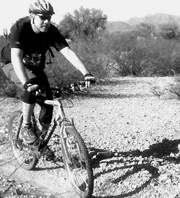 Recently on the Weekend Soundtrack series, we heard from a mountain biker named Charles Wommack, who is recovering from a stroke. His story inspired Sara Benson to write in about her own recovery from an accident that happened on a bike. To find out whether digital sampling is breaking the law or the inevitable future of music, we speak with Kristin Thomson of the Future of Music Coalition. John Moe: Kristin, welcome to Weekend America. Kristin Thomson: Thank you, John. Moe: Is Gregg Gillis engaged in theft? Thomson: It's hard to say. There is a legal question there. The things I've read from Gregg Gillis and his label, they're trying to take a fair use defense in their rationale for how they decided not to clear the samples. Moe: So is there such a thing as a fair use law? Or is it all case by case and open to interpretation? Thomson: It is all case by case and open to interpretation. Moe: As you observe the future of music from your vantage point at the Future of Music Coalition, is this an important test case? Is Girl Talk going to be talked about years from now? Thomson: I'm not sure. Girl Talk might be. But I think what this points to is that the sample license clearance process that exists now is inefficient and cumbersome. Now, that doesn't just mean that people should avoid it because it's inefficient and cumbersome. It does, though, have us start to think about how we can make it more efficient so that the barriers to having people clear samples properly are reduced. To the point where there's less friction and there's more chances for people to license and talk to the people who actually own the rights to the records. Moe: So Kristin, it sounds like Gregg may be engaged in theft, or he may not be. It depends on the concept of fair use, which has no legal definition, and would depend on an individual court case should any cases be brought to court, which thus far none have been against Gregg, so we just don't know. Thomson: That's a good summary. Moe: Well, good to know we've worked all that out. Kristin Thomson from the Future of Music Coalition, thank you so much. It's not where you take something from. It's where you take it to. Your article about music mashups and copyright infringement reveals the problem with U.S. intellectual property law. Basically, this Byzantine conglomeration of rules has destroyed live music and many other artistic industries. If Gregg Gillis were to actually try and buy the electronic performance rights to his samples, he would find he pays the same rate as, say, Shakila does when she quotes a song on a multimillion dollar album. As a one-time jazz musician I discovered I had to pay about a dollar a song, around $30 an hour, for the privilege of trying to make Gershwin recognizable while playing for tips at the local coffee house. And, unlike patents, the copyright lasts for 90 years after the death of the composer. If patents were subject to the same rules, the grandchildren of the Wright brothers would still be getting a fee, not only every time an airplane was built, but every time one took off or landed. The effect on air travel would be similar to the existing effect on music.